Televue 21mm Ethos Eyepiece - 2"
The Televue 21mm Ethos Eyepiece provides a 100° apparent field for a true "spacewalk" view of the night sky. With an effective field stop diameter of 36.2mm, the true field of the 21mm Ethos is close to that of the much loved 35mm Panoptic. Televue 21mm Ethos Eyepiece provides a generous 15mm of eye relief for comfortable observing. The Tele Vue 21mm Ethos Eyepiece has a dedicated 2" barrel. Dramatic mid-level magnification views combine with stunning wide field backgrounds. Extending the Ethos focal length range to 21mm while maintaining the original performance goals of the rest of the series brings the eyepiece up against the mechanical limits of the 2” barrel and focus constraints. 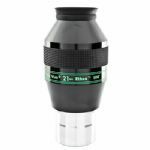 The 21mm provides the maximum true field of view, has no significant vignetting at the edge of the field, and is parfocal with the 31mm Nagler Type 5. The 21mm focal length completes the logical set of 21mm/13mm/8mm and nicely juxtaposes the 17mm/10mm/6mm combination. Each step within these two sets approaches a 3X field area gain. The 21mm’s effective field stop diameter is 36.2mm, bringing its true field close to the 35mm Panoptic (38.7mm Field Stop diameter). Its true field is also larger than the 26mm Nagler with its 35mm effective field stop diameter. In an f/4 Dobsonian, the exit pupil is just 5.25mm using the 21mm Ethos instead of 8.75mm with a 35mm Panoptic, or 6.5mm with a 26mm Nagler.